James Coplan, M.D., Neurodevelopmental Pediatrician, Author and Speaker » Blog Archive » Camelot. Dr. Coplan reflects on the legacy of inexplicable loss. Camelot. Dr. Coplan reflects on the legacy of inexplicable loss. I told myself I wouldn’t go: “It’s morbid. It will stir up old memories. What’s the point?,” but when I found myself in Dallas earlier this week, I was drawn, irresistibly, to the spot. 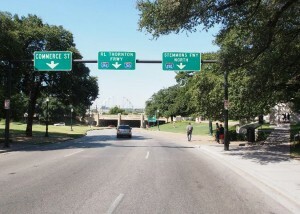 The car in the photograph, directly under the highway sign, is at the approximate spot where JFK was shot. Dealey Plaza is to the left. The Texas School Book Repository is behind me, the 6th floor windows high above (Here it is from the car’s point of view). The grassy knoll, from which many people claim to have heard gunfire, is immediately to the car’s right. A lot more than JFK died that day. My own innocence, most of all. In 1959 Elvis was in the army, Buddy Holly topped the charts, and in Atlantic City a guy with the odd name of Chubby Checker was dancing something called “the Twist” at the Steel Pier in Atlantic City. Buddy Holly would be dead before the year was out. In 1960 Elvis would exit the army and reclaim his crown, and the Twist would become an international sensation. Ike, who had commanded the Allied forces on D-Day, was nearing the end of his second term in office, and two young candidates were squaring off for the upcoming presidential election. I was in the 7th grade. In 1960 I avidly watched the first-ever televised presidential debates, between JFK and Richard Nixon (go here for the first debate). In ’61 I watched JFK’s inaugural, at which he had addressed the “long twilight struggle” we then faced with the Soviets, who promised to “bury” us. Throughout his “thousand days” in the White House, Kennedy’s regular, live press conferences showcased his nimble wit. (He could also be brutally candid about himself: “Victory has a thousand fathers, but defeat is an orphan,” he declared after the failed Bay of Pigs operation.) Many of the issues he discussed at those unscripted press conferences are still with us. (Spend an hour here.) And of course there was “Camelot” – the mythical realm of Arthurian legend, briefly reincarnated and presided over by JFK and Jackie – that “will never be that way again.” Gone. All gone. This may be a bit of a stretch, but in some ways loss of Camelot may not be so different from loss of that anticipated perfect child. (Yes, ASD confers strengths as well as vulnerabilities, but I don’t think there are many neurotypical parents who would seek for their child to be born with ASD.) And perhaps my nagging question “What really happened?” is not so different from your own questions: “Why my child? Could something have been done to prevent this?” It’s important not to wear hardship as a hair shirt, living out one’s life as “Oh, poor me!,” accompanied by endless weeping and gnashing of teeth. Or endless guilt. Or endless anger. But it’s also important to give misfortune and mourning their places at the table, lest we succumb to the paralyzing notion that “Everything is always for the best.” Everything is not always for the best, and it’s our duty to gain as many yards (or inches) as we can towards picking up that next first down, in whatever time is allotted to us. I scanned the grassy knoll, looking for – what? I did not go into the Book Repository Building, where an interpretive display awaits the visitor. I am agnostic about whatever “really happened.” I have resisted conspiracy theories, but at the same time I find the official version of events unsatisfying. For me, the day “the music died” was not 2/3/59 – the date of the air crash that took Buddy Holly, Richey Valens and the Big Bopper – but 11/22/63. And my innocence did not even die a clean death. Loss of Camelot – even a mythical one – is akin to loss of the anticipated perfect child.